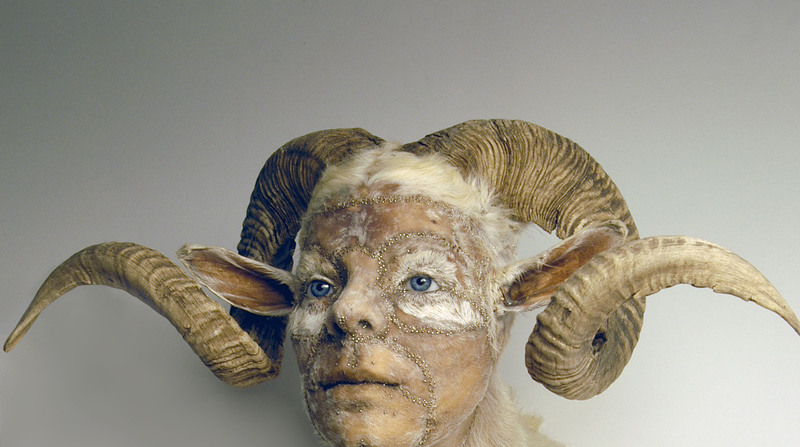 Kate Clark, "And She Meant It", 2010, ram hide, apoxie, clay, foam, thread, pins, rubber eyes. Photo courtesy of the artist. “My Monster: The Human Animal Hybrid” explores our enduring fascination and revulsion with the merging of the human and animal, and coincides with the 200th anniversary year of the publication of Mary Shelley’s Frankenstein. The desire to preserve distinct categories for animals and humans can be traced back to the Middle Ages. Humanity’s perceived uniqueness and dominance over the natural world was defined by its separation from the animal, and still lingers. Witness our current obsession with body hair removal. The trouble with hybrids is that they disturb our moral compass, reminding us that we are animals, and animals are like us. This is the power of the hybrid creature. When we look into its human eyes, we see ourselves looking back from the animal body we deny we inhabit. Rose Agnew, Jane Alexander, Janet Beckhouse, Peter Booth, Jazmina Cininas, Kate Clark, Catherine Clover, Beth Croce, Julia deVille, Heri Dono, Peter Ellis, Moira Finucane, Rona Green, Ai Hasegawa, Rayner Hoff, Sam Jinks, Deborah Kelly, Bharti Kher, Deborah Klein, Oleg Kulik, Sam Leach, Norman Lindsay, Sidney Nolan, Eko Nugroho, Patricia Piccinini, Kira O’Reilly & Jennifer Willet, Lisa Roet, Geoffrey Ricardo, Mithu Sen, Maja Smrekar, Ronnie van Hout,1).